Although most of the people use microwave to reheat and defrost the frozen food, but that makes it a mess. Vegetable chunks, splattered food, cheese stains decrease the working efficiency of microwave and makes it unhygienic as well. Therefore, frequent cleaning of microwave is essential. 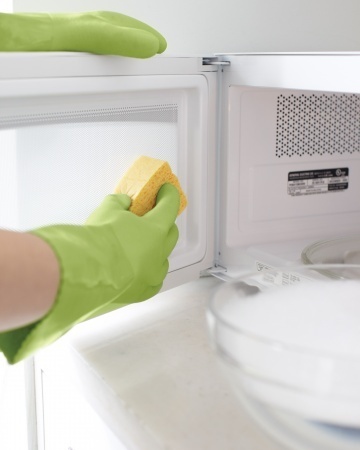 The tips discussed below are easy to do and help maintain a sterile and clean microwave. So, use them and don’t fear heating up the sauciest and cheesiest meals. Take a microwave-safe bowl and fill it half with water. Now, squeeze a lemon into this water. Place the bowl in microwave and turn it on. Set it for five minutes. Wait for a couple of minutes, open the door of microwave. Take out the bowl and spinning plate very carefully. Use a sponge and wipe out all the dirt and food remains. Keep the plate back in the microwave after cleaning it. Take a microwave safe bowl and fill it half with water. 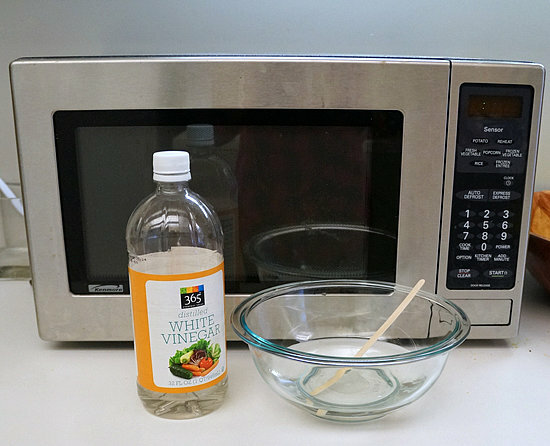 Mix a tbsp of white vinegar in it and place it in the microwave. Turn on the microwave for five minutes. The entire dried gunk on the wall of microwave will loosen with the steam. Now, wipe down all the sides of your microwave. Take out the spinning plate and wash it with water. You are done with the cleaning process. Note: The solution of vinegar-water will be extremely hot after heating. So, it is suggested to wear gloves. 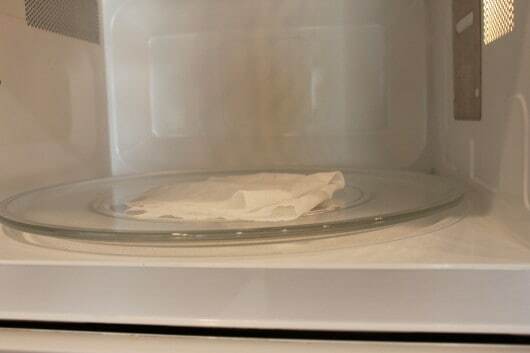 Put a handful of wet paper towel in the microwave. Turn it on and wait for five minutes. The steam produced from the paper towel will soften the gunk. Let the paper towel cool down. Afterwards, use them to wipe down the inside of the microwave. Prepare a mixture of baking soda and warm water in 1:2 ratio. Apply it on dried on gloop and spills. Leave it for five minutes. Now, use a sponge and clean this solution. Use a paper towel for final touch. 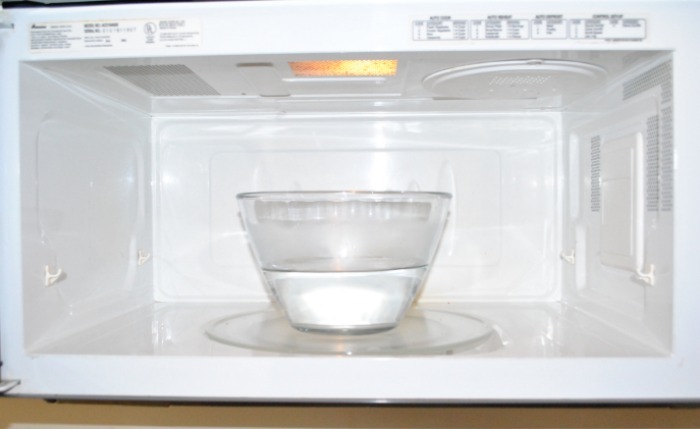 Fill a microwave safe bowl with warm water. Add dishwashing liquid to it. Put the bowl filled with warm water in the microwave and turn it on for a minute. Wait until the water starts steaming. Now, take out the bowl and clean the microwave using a damp sponge. Leave the door open sometime. Try to clean your microwave two times a month. Take some window cleaner and a rag to clean the door from both sides. Mix window cleaner and warm water in 2:1 ratio. Remove the spin tray and clean the base of the microwave. Leave this solution for five minutes on tough spots before scrubbing. Later, scrub and wipe it with a clean rag. Wipe it out after five minutes with a clean paper towel. You can also clean the handles and buttons of the microwave with the window cleaner. Leave the door open for sometime so that it dries completely. Take a wet cotton dishcloth. Place it on the spinning plate. Turn the microwave on for 5 minutes. Allow the dishcloth to cool down. Later, wipe down the inside of an oven using this dishcloth. Ensure that the dishcloth is made of pure cotton and does not catch fire during the cleaning process. Do not leave the kitchen and be alert during this process. Fill a glass bowl half with water. Place it in a microwave and turn the oven on. Keep the door closed for 2-3 minutes, as the steam produced will help loosen the tough and dried gunk. After some minutes, take out the bowl and clean the interior of microwave with a soft rag. Wipe microwave after every use. Leave the door open for at least 10 minutes after cooking in the oven. Clean it at least twice a month. Use lids while microwaving foods.